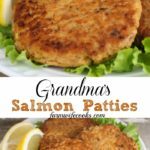 Grandma’s Salmon Patties are an easy recipe that uses canned salmon and is one of grandmas most requested meals! 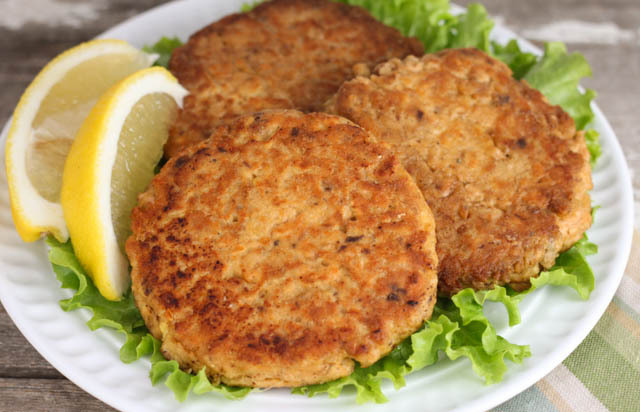 My husband is not a seafood fan but he loves these Salmon Patties and so do our boys! 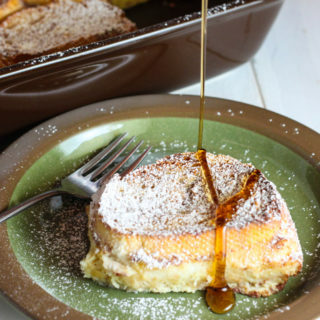 This recipe is one of his grandma’s staples and everyone from the farm help to the Fedex man have been known to stop by when she is making them! 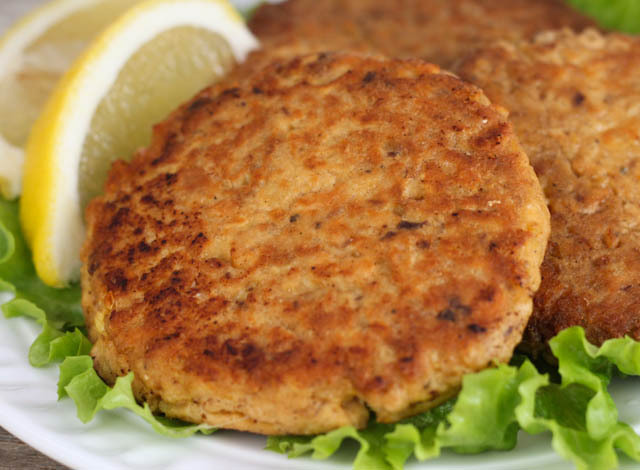 Salmon Patties make the perfect family friendly, Friday meal during Lent but are enjoyed here all year long. Grandma insists that you must use the red label Royal Salmon canned salmon. I have the best luck finding it at Walmart. But, you could also use leftover fresh salmon or any other variety canned salmon. 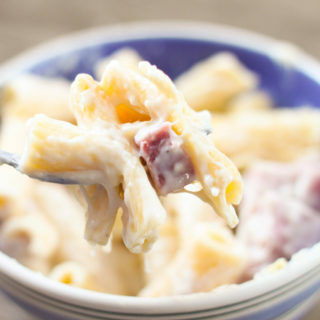 This recipe is easy to make, the hardest part is removing the bones. They are soft enough that some people don’t bother removing them but I always make sure to remove as many as possible. The only other tricky part is to get the moisture right. If the mixture is too wet it will be hard to make the patty and if it is too dry it will make the patty dry. That is why the recipe card says 5-7 crackers so you can add the amount needed. Grandma always serves them with fried potatoes (yum) and creamed peas. Drain the salmon and remove the skin and bones. In a medium bowl mix remaining ingredients. If the mixture seems to wet and another cracker or two. Divide mixture into 4 equal parts and form patties. Heat butter/oil in a large skillet and cook on both sides until brown. We love salmon patties. These looks so delicious! My Mother used finely diced onion an instead of crackers she used what we grew up with “crushed POST TOASTIES” in other words crushed corn flakes ! since I heard the bones are very good for you, I mash up the bones an use them. Otherwise the same recipe!. Oh so yummy! We served ours with creamed peas over the top! Thanks you! WHEN TALKING ABOUT SALTINES ARE YOU TALKING ABOUT 5-7 SINGLE LITTLE SQUARES OR 5-7 LARGE SQUARES THAT HAS 4 CRACKERS EACH? HI Brenda! Great question. Individual crackers. Enjoy! I leave the bones in the mix. They’re so soft you don’t even notice them if you don’t see them. My in-laws had salmon contests to see who found the most bones! The bones are soft, just mash them with a fork and mix them in. Adds extra calcium which is good for you. You can buy skinless boneless salmon in cans. Most all stores carry it. What could I use in place of eggs? I am not allergic to them…..just don’t like them! Would Mayonnaise work? And yes I know it has eggs but it’s not like I have to see them!!! Thanks! Yes, you can use mayo, I do, and they’re nice and moist. I use about an 1/8 to a 1/4 C. mayo for a large can. I also add a good pinch of Dill Weed, and you can also use a 1/4 C. Panko or Progresso Bread crumbs, garlic flavor. I have never made them with mayo but it sounds like other people have. If you try it let us know! Enjoy! I have been making these since the Great Depression. It’s an old save money recipe Yes, I use Best Foods mayo in this recipe, or close to this recipe. About 1/4 cup, maybe a bit more. Mix well. And I also use eggs and about 18-20 crushed saltines. I also use finely chopped green onion. Love it and so do my Grandsons. In the picture they look just like the ones my family has made for years. But when I read the recipe it was very different. We use a mixture of mostly cornmeal with some flour and salt, and only 1 egg for every 2cans of salmon (if using the kind with skin and bones, 3cans if using the boneless skinless kind). We also serve ours with fried taters.Not sure if Iwould try this version, mainly because of that squirt of lemon. I’ve never understood why so many chefs like lemon with seafood. I detest it. To me lemon with seafood is just plain nasty. Oddly enough I don’t mind lime with most seafood. Hubby was reading over my shoulder. He says I should just try your recipe and just leave out the lemon. Maybe I will. One question though… do you use chum salmon, pink salmon , or red salmon? Royal Salmon is not ayailabe at th Walmart’s around here. I’m in north central Texas on the western half of the Dallas/Fort Worth metroplex. I’m really perplexed with the statement “I’ve never understood why so many chefs like lemon with seafood”. Wha, what??? I can appreciate that you detest it, we all like what we like but to make such a statement is absolutely absurd.You obviously understand that splash of acid is, in fact nice with seafood with your use of a bit of lime. I’m not being rude but come ON….That would be like someone saying “I’ve never understood why so many adults use the word “taters” when speaking of potatoes….” Well, there are more than a few reasons why one being that someone is country (like my husband) and that’s just what he says when he would like to have potatoes. The point being, I would never make such a broad statement. I have NEVER replied to people’s comments on a site, never but yours was seemingly just fluff. It wasn’t helpful nor respectful in fact, it was rather unkind. Why could you not just ask “Do you use chum, pink or red salmon because Royal Salmon isn’t available in my area.”? Give this a try or don’t but don’t be so negative about a recipe that you’ve never tried and seemingly never will. I appreciate the time and effort and heart that people put into their recipes whether or not I like the ingredients or I prepare it another way. Perhaps the next time you see a new recipe you will just give it a try and then be helpful and courteous with your comments……..
LIKE ME NEITHER BUT WHO CARES BE YOURSELF AND CONTINUE WHAT YOU ARE DOING!!! Hi Donna, you could use lime instead of the lemon or leave it out all together. My mother made hers the same but added a can of tuna to make “stretch” further and I think is tastier! Sorry, but lemon always goes with seafood, makes the taste better and you do what you wish!!!! It is neat to see the variations in recipes! We’ve always used one can of salmon (de-boned and reserve the liquid), one sleeve of saltine crackers, and one egg – I usually end up adding the liquid from the can back into the mix so it is moist enough 🙂 I will have to try the lemon sometime. We love salmon cakes at our house too. My recipe is almost the same as yours. Except after removing skin, bones and liquid. I use only one egg and for extra moisture I use about 1/4 cup milk to which I add either lemon juice or vinegar. Then add enough crushed saltines to thicken the mixture. Then roll a large spoonful of the mixture in additional crushed saltines before making them into patties. Adding a tablespoon or two of bacon drippings to the oil in which you cook the patties adds a nice extra flavor too. BACON IS ALWAYS A GOOD FLAVOR FOR ANY FOOD YOU COOK, IT JUST GIVES A GREAT FLAVOR. I love salmon patties. I always just crush the bones with my fingers. They’re very good for you so it’s a shame to pick them out. 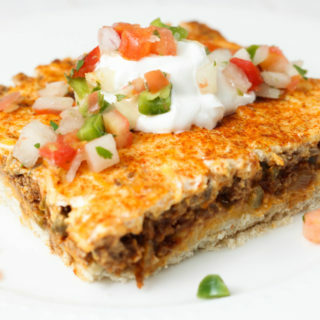 This recipe is just the way I make mine, except I add Old Bay seasoning. GREAT, THE BONES ARE CALCIUM AND THE SKIN HAS OMEGA 3, WHEN i MAKE MINE i ADD THE WHOLE THING BONES AND ALL. IF i BUY FRESH SALMON I BUY WITH THE SKIN ON THE SKIN IS GOOD FOR YOU. I use the bones and skin too. That’s where the good stuff is! I have been making these forever and my kids love them. I also use a white gravy on top that makes them even better. I add finely diced onions to mine. Really adds flavor. Instead of crackers, I use store bought bread crumbs and add a couple of tablespoons of flour to help them stay intact. These look delicious. What would you use instead of saltine crackers for those who are celi? Hi Gwen, My friend Megan has a low-carb recipe that would work. Here you go, https://www.theseoldcookbooks.com/low-carb-salmon-patties/. I like them with bones left in, diced onions in, and some Old Bay Seasoning mixed in too. The bacon drippings comment sounds interesting. I’ll give it a shot. I like to serve peas with them – not sure why but they just seem to “go”. Why remove the skin and bones? The skin is harmless and the bones are very high in calcium and sure won’t choke anyone. Canned salmon is even recommended as a good source of calcium, but you would lose that by removing the bones. Not to mention how time consuming that must be! A childhood favorite of mine but I couldn’t remember exactly how my momma used to make them. I remember now. The only thing different is we didn’t use lemon, it wasn’t on hand. Thank you so much for sharing! I love salmon patties. They were a Lent staple growing up. My mom always put green pepper and onion in hers and I do too. It gives it a pop of flavor! I have never tried Mayonnaise. I might have to try that, sounds good. What is old bay seasoning like? Never used it before? 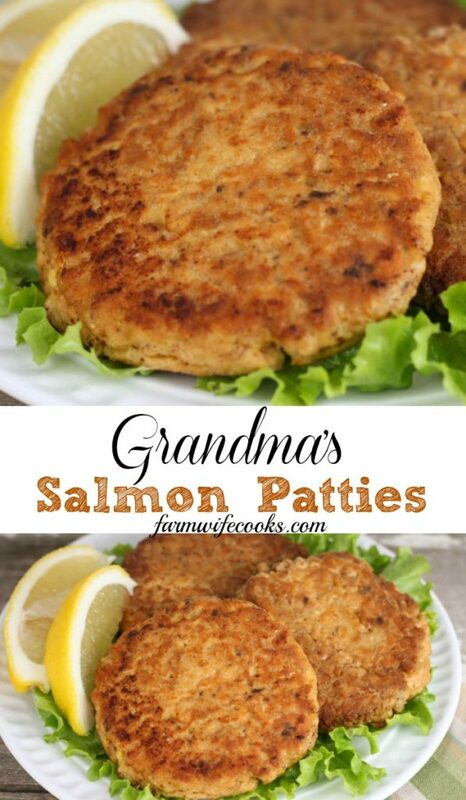 I make salmon patties all the time like my mom did. Canned red salmon minus the skin and bones. Or canned pink salmon which is cheaper and now available skinless and boneless. I add minced onion, matza meal which is similar to saltines but less salty, and egg. I mix it all up, and put the patties in pan sprayed with cooking spray and bake in a 375 degree oven, turning the patties over after about 20 minutes, cook time should be 35 to 40 minutes for nicely browned patties. Leftovers can be reheated or eaten cold in salad, or as a sandwich with butter or margarine spread on the bread. My daddy’s recipe, with some onion cut very small added. My family loves them.